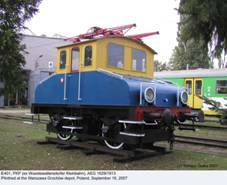 E401 (AEG 1629/1913), the oldest surviving electric locomotive in Poland, photographed at the Grochów depot, Warsaw, on September 18, 2007. Another picture, taken on the same occasion. ...and hauling a draft typical for this line (from S.Bufe, J.Klaer Götz, Eisenbahnen in Schlesien, Alba Verlag, Düsseldorf, 1971). Note current collectors different than those currently fitted. Another picture of the E401, taken on September 21, 2010. After WWII Polish state railways PKP took over a number of locomotives previously used by German private local railways. Most of them were tank steam locomotives for mixed traffic, but there were several notable exceptions. One of them was E401. This diminutive electric locomotive was built by Hannoversche Waggonfabrik in 1913 (s/n 1629) for the Wüstewaltersdorfer Kleinbahn A.G. Electric equipment was supplied by Allgemeine Elektrizitäts Gesellschaft (AEG). The company ran a short line – less than five kilometers in length – between Wüstewaltersdorf (now Walim) and Hausdorf (now Jugowice) in Lower Silesia. At an early design stage it had been decided to electrify the line at 1 kV DC. Construction works began in May 1913 and it was intended to open the line in May 1914, as the first electrified line in Lower Silesia; however, due to delayed delivery of rolling stock, it was opened in July and the priority went to another local line. Rolling stock comprised a railcar with a trailer car and E401, which was used for mixed traffic. It was a small, two-axle locomotive, based on streetcar technology, with two nose-suspended electric motors. According to data quoted in SK, it was able to haul an 80-tonne draft on a 30‰ gradient at 10 to 12 km/h and a 50-tonne draft at 20 km/h, tractive effort being about 3 300 kG. As far as I know, only one example was built. In the 1920s two original bow-type current collectors were replaced by a typical DRG pantograph. Cab roof, initially made of impregnated sail-cloth, was later replaced by a steel sheet. The railway managed to survive the Great Crisis and WWII. Immediately after the war almost all electrified tracks in this area fell victim to Soviet ‘booty squads’, all locomotives, rolling stock, equipment and contact lines being taken to the USSR. 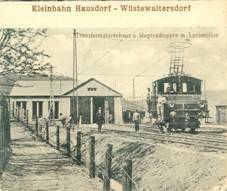 The Wüstewaltersdorfer Kleinbahn somehow survived, probably due to its small length and untypical current supply system. Like all pre-war private lines, it was taken over by PKP. Operations re-commenced in October 1947 and continued until October 1959, when they were formally suspended due to deteriorating track condition and complete lack of spares. 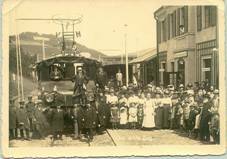 Irregular small-scale traffic (with steam engines) continued until early 1975, when the line was finally closed down. All vehicles, including the E401, were transferred to a railway school in Wrocław in 1959 and scrapped in the 1980s. Only the locomotive somehow escaped the cutter’s torch. It was refurbished by the ZNTK (Railway Stock Repair Works) of Lubań Śląski in 1987 and transferred to Warsaw. 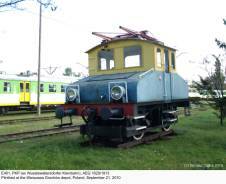 E401 is the oldest electric locomotive preserved in Poland. 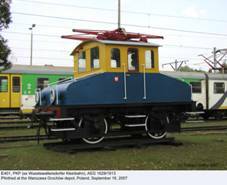 Currently it is plinthed at the Grochów depot of Koleje Mazowieckie and will not run anymore: there is no line electrified with 1 kV DC. According to some sources (www.bluefish.foxnet.pl), this locomotive was, or was to have been, re-designated EU40-01. In fact this conforms to the designation system introduced in 1958; the problem is that E401 was withdrawn only a few months later and re-designation was most probably only formal. Currently the locomotive has only the national emblem (smaller than typically carried by PKP stock) and no service number at all. Photos from early 1990s show it, already at the Grochów depot, with the PKP logo. - Rafał Wiernicki (private communication – thanks for the photos! ).